I am super excited to let you all know that the folks over at MYOBUDDY have given me a coupon code to give you guys! This machine has been a lifesaver on my preps! I highly recommend it. 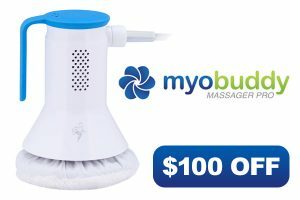 If you factor in the $100 or more per actual in person massage that you can maybe get to once every few weeks this thing is well worth it as you can use it every day! The Coupon code for $100 OFF + Free shipping + No tax. This works for ANY Myobuddy Massager. If you get it let me know how much you loved it!